Rocket attacks from Gaza hit the town Kiyrat Malachi. Three people were killed in rocket attacks from Gaza hit southern Israel in the midst of a growing clash. 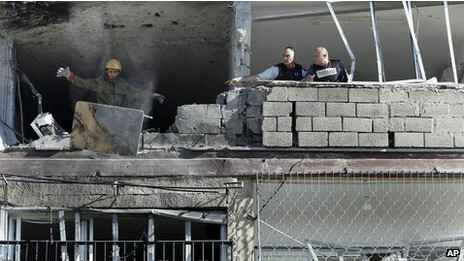 Three Israelis were killed when a rocket hit the building at the city level four Kiyrat Malachi. They were the first victims of the Israeli military since the assassination of Hamas leader in Gaza on Wednesday. Meanwhile, 11 Palestinians, including children, were killed in Israeli military operations. Police said since the assassination of Hamas military leader, 130 rockets were fired into Israel. Hundreds of rockets fired at Israel by militants in Gaza and Israel launched air strikes in a number of cross-border clashes in recent weeks. Israel says the head of Hamas' military wing, Ahmed Said Khalil al-Jabari, who died when his car was hit by an attack in Gaza City, is considered responsible for all attacks from Gaza in the last ten years. Three Israelis - two women and a man were killed when a rocket hit-roof building in Kiryat Malachi, which is located about 25 kilometers north of Gaza. Three others, a four-year-old boy and two babies, were wounded, said Israel's foreign ministry. Residents who live in the building through the siren warned about possible attacks but did not have enough time to save themselves, according to some reports. After a relatively quiet night, clashes broke out again on Thursday morning (15/11), says the BBC correspondent in Gaza, Jon Donnison. Meanwhile, Israeli Transport Minister Israel Katz told the BBC that "if the attacks do not stop, Israel will also be looking for targets (Hamas leader) Ismail Haniyeh." Commenting on the raid that killed the military leader Jabari, Hamas said it would "open the gates of hell" for Israel. In Gaza City, a lot of people who gathered for the funeral of Jabari and determined to strike back.